Cahaba River Society’s Shane Hulsey CLEAN Environmental Program provides students from third grade through college with hands-on environmental education activities while they safely participate in a canoe trip, stream walk, or volunteer service-learning restoration project. 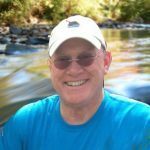 The program is named in honor of the life and legacy of former Cahaba River Society Education Director Shane Harper Hulsey. Since 1996, the CLEAN program has safely taken over 37,000 Alabama students to the Cahaba River. Would you like to book a CLEAN Environmental Science Field Trip for your school, scout troop, church group, club, or other group? Give us a call at (205) 322-5326 or send us an email! Get everything you need to prepare for your CLEAN Environmental Science Field Trip. The CLEAN Environmental Education Program offers a diverse and adaptable curriculum designed to educate, motivate and inspire youth to take active roles in the environmental health of our community. Young people have a natural curiosity about science and the environment, and CLEAN’s interdisciplinary field and classroom curriculum encourages critical thinking by students and prepares them to make informed decisions about water resources. The CLEAN Environmental Education Program teaches the science that underpins stewardship while engaging young people in fun, healthy outdoor play, helping to foster a new generation of informed citizens and leaders. Age-appropriate field activities include watershed orientation, collecting and learning about fish and macro invertebrates, learning how to canoe, and water quality testing. CLEAN provides educational, interactive activities such as canoeing, stream-wading, collecting fish and other aquatic organisms; river basin map study, and more. These hands-on program components teach about where our drinking water comes from and how to keep it healthy and abundant. 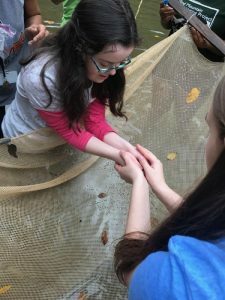 Students learn that the Cahaba River is one of the most biologically diverse in the world, and that it is recognized internationally as a critical river ecosystem. Participants are empowered with knowledge to help make informed decisions—both now and in the future—to safeguard this water resource. CLEAN helps to create a personal connection between a healthy Cahaba, high-quality drinking water and our rich heritage of freshwater life. Through these healthy and informative activities students develop an understanding of, and appreciation for, nature. Since 1996, the CLEAN program has taken over 36,000 Alabama students to the Cahaba River for environmental science field trips, and our safety record is excellent. While scrapes or bruises typical of childhood play occasionally occur, we have never experienced a serious accident. Our field trips are carefully organized to ensure the participant’s safety. Our staff hold current First Aid and CPR certifications. Numerous area schools, church youth groups, Scouts, and parents trust the CLEAN program with their children’s safety. Watch this short video to see scenes from some of our field trips! The vision of CLEAN is that our young people become knowledgeable and healthy adult leaders and act as good stewards to ensure their drinking water remains healthy & abundant and their rivers are clean & life-filled. We are expanding CLEAN to serve more urban and rural disadvantaged youth, especially those of color and low income, to give them a positive outdoor experience that enhances learning and connects them with water resources. 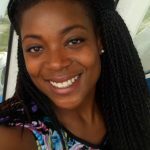 La’Tanya Scott, Environmental Educator, holds a degree in Environmental Science from Miles College. Even before her graduation, La’Tanya knew that she wanted to work in nature and to inspire people to love the outdoors as much as she does. From childhood, she has always had a passion for being outdoors and helping people, and she credits her family with strengthening that passion. La’Tanya is a skilled outdoor educator and role model who strengthens our outreach and service to urban schools and youth of color. 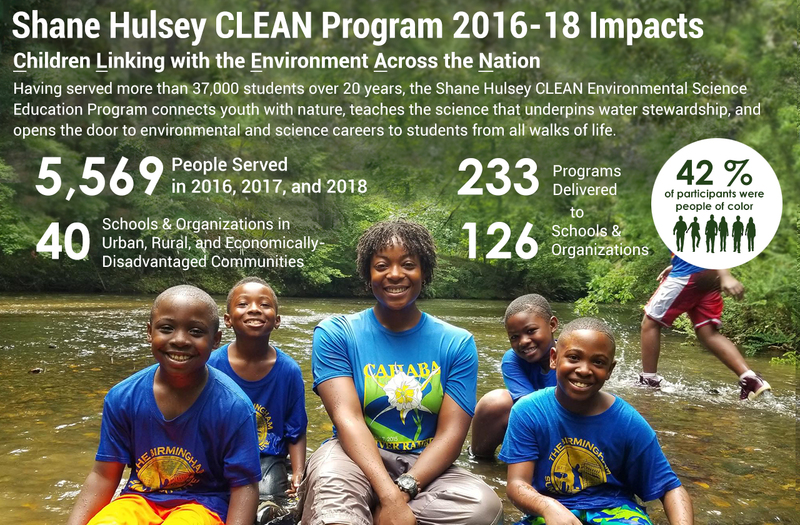 She delivers hands-on environmental education programs to students in the classroom and in the field through the Shane Hulsey CLEAN Environmental Education Program. Her intense interest in the Cahaba River, her skills and knowledge, and especially her boundless enthusiasm will help many additional area students understand the importance, and the wonders, of the Cahaba River.